There was a period of time when I wanted to ease myself into vegetarian cooking. It was healthier and of course you feel a bit more humane. It didn't last very long, however, I just miss eating steaks and seafood too much. I, however, got one thing out of it, I had lots practice with making pho chay. I really admire vegetarian cooking, especially Vietnamese vegetarian dishes. A lot of times it taste so much similar to the original dish and taste so good that you hardly notice the meat is missing. With any soups, the most important factor is the broth. I use a lot of roots vegetables to make the broth for pho such as; daikons, carrots, leeks, cabbage, onions, and ginger. You'll want to cook these vegetables down until they basically fall apart, and then remove them from the broth. You will attain a very subtle and sweet broth and the only thing you will need to season the broth is salt and spices you use to make traditional pho. Instead of meats, I use tofu, mock meats, and more vegetables. You'll want to sauteed the tofu and mock meats with some soy sauce and sugar so it's not bland in the soup. I lightly blanch my favorite vegetables such as carrots, broccoli, baby corn, and mushroom to add to the soup. Make sure you season each component well; the broth, the "meats", and the vegetables. I would totally choose traditional pho over pho chay any day of the week but it's nice having options for certain occasions. When lent come around, I have another noodle soup option. When you are feeling ill and in need of something light and warm, pho chay is a great option. Are you having vegetarian guests for dinner? You can't go wrong with introducing Vietnam's most famous soup pho, but vegetarian style. Hope you will find this recipe helpful in the future, enjoy! 1. Wash and prepare the cabbage, daikon, and about 3 carrots. Put these ingredients in a 6 quart pot and fill it up with water. Let the vegetables cook down in the broth and then season with sugar, salt, and soy sauce, and mushroom seasoning. Once the vegetables fall apart or has cooked down enough, remove the vegetable. 2. Broil the ginger and onion in the oven. Remove any skins and then add to the pot as well. 3. Roast the spices in the oven, you'll need about 2 cinnamon stick, 5 star anise, and 4 cloves. Add the spices towards the end when the broth is done and ready. Remove the spices after 15 minutes. 1. Cut the tofu and meats to bite size. 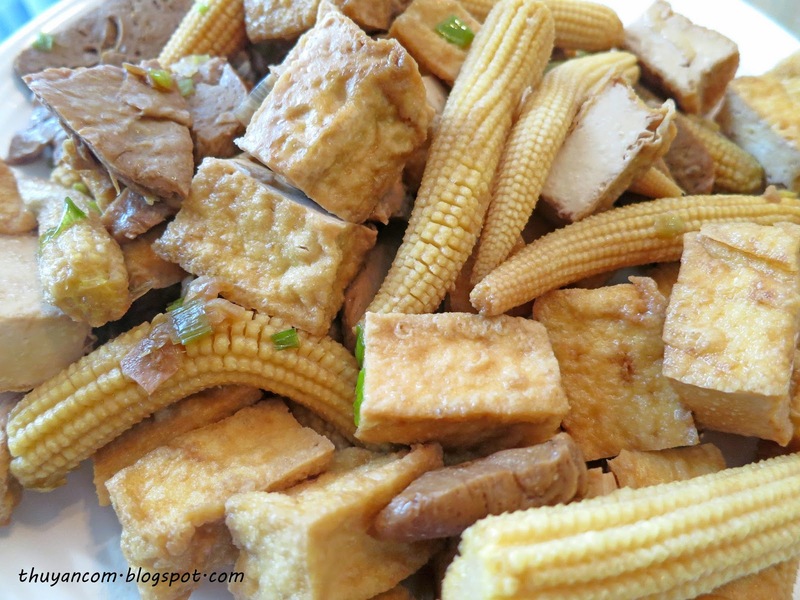 Heat up some cooking oil in a pan, and sauteed the tofu and mocked meats with some soy sauce and a little bit of sugar. Make sure you seasoned it well and the tofu is cooked all way. 2. 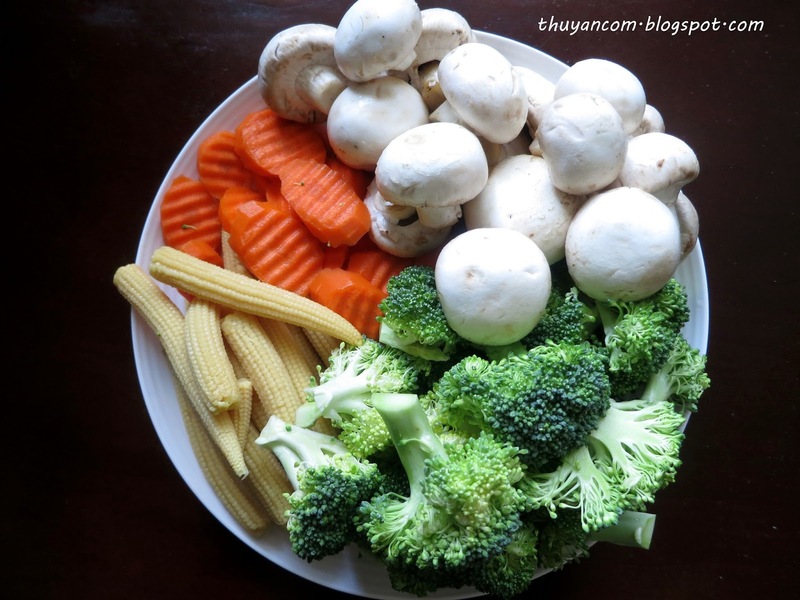 Cut up the broccoli and carrots and mushroom. 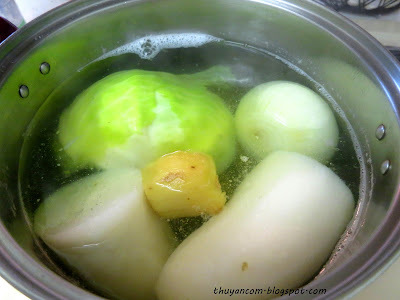 Blanch all them and the baby corn in boiling water and add enough salt to give the vegetable some taste on their own. If you prefer more flavor, you can sauteed the vegetables with soy sauce and sugar just like the tofu. 1. Prepare the pho noodles, lime, and garnish for the soup. 2. 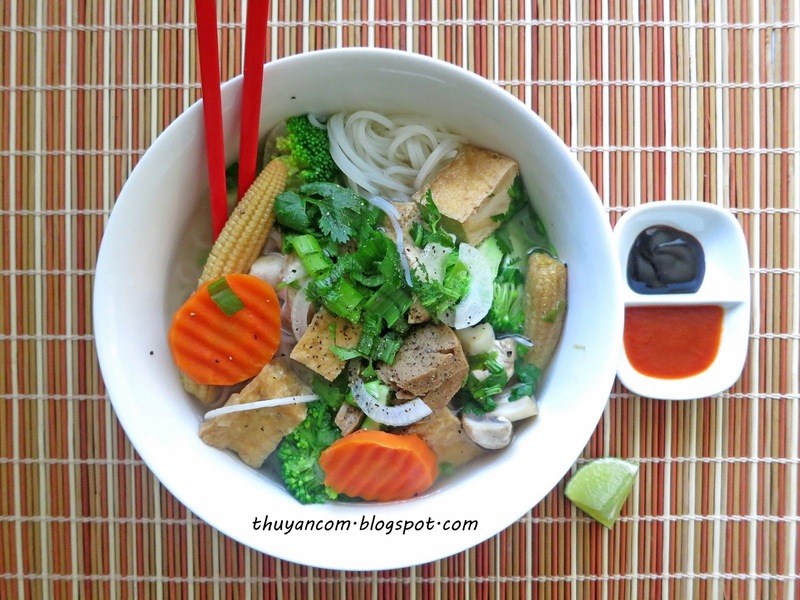 Put noodles in a bowl, add the tofu, mocked meat, and vegetables on top. Add hot broth and then topped off with the garnish. 3. Add hoison and sriracha to your liking, and enjoy!